Saag Paneer is a beloved Indian spiced spinach dish with soft, homemade paneer cheese folded in. In this easy at home version, you can substitute salty feta cheese instead of paneer. The key to this recipe lies in the aromatic seasonings. Not only does it include onion, ginger, and garlic, but there is a decadent blend of cumin, coriander, turmeric, garam masala, and red pepper flakes. These flavors elevate humble spinach leaves into a delectable dish. Looking for a vegan version? 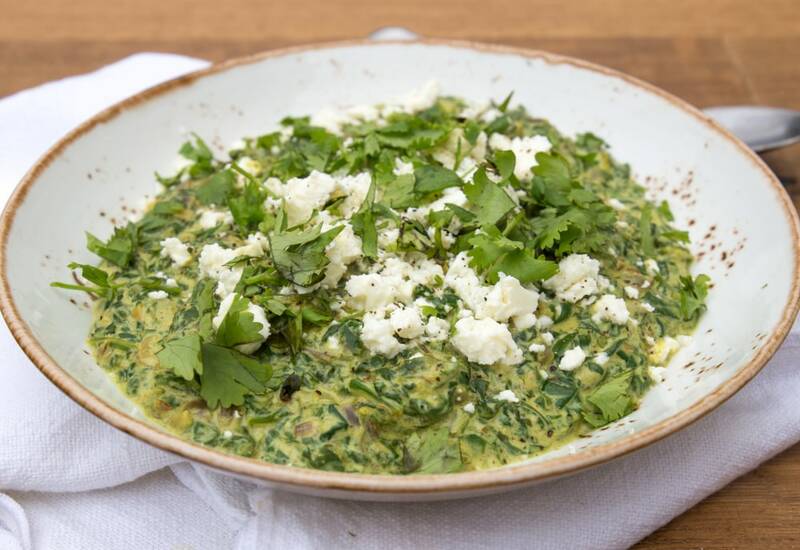 Simply, omit the yogurt and feta for a dairy-free spinach side dish. Per Serving: 288 calories; 20g fat; 19.3g carbohydrates; 14g protein; 33mg cholesterol; 1002mg sodium. I love saag for the creamy, smooth, flavor packed dish that it is, I'd never made it at home before but this saag came out pretty great! I think I'll stick to paneer in the future over feta though. If you're not as familiar with indian food this is a decent place to start. This spinach saag was really creamy and delicious. I served it with naan and a side of rice. All of the spices, like the garam masala and cumin, together are fragrant and delicious. I used feta cheese but not the yogurt in this dish. It was pretty good as a side, I served it with Indian chicken curry. It was really simple and very aromatic. I did a combination of mustard greens and spinach, and left out the yogurt and feta for a dairy-free take. Served it with basmati rice and tandoori chicken. Left out the yogurt and feta cheese for a vegan take on this spinach dish. Lots of really good, aromatic spices which bring out the true essence of Indian food.